Through "Delivery System Reform Incentive Payment" (DSRIP)<https://www.macpac.gov/publication/delivery-system-reform-incentive-payment-dsrip-programs-2/> programs, authorized under Medicaid Section 1115<https://www.medicaid.gov/medicaid-chip-program-information/by-topics/waivers/1115/section-1115-demonstrations.html> waivers, states can use anticipated savings to test cutting-edge ways to improve how care is paid for and delivered. DSRIP<http://www.chcs.org/delivery-system-reform-incentive-payment-program-model-reforming-medicaid/> funds are commonly used to reward eligible provider entities - usually, but not always, led by hospitals - for meeting performance milestones. These milestones are typically for care delivery enhancements and payment reforms including value-based payment models. Since May 2015, CHCS has been helping New York DSRIP<http://www.chcs.org/delivery-system-reform-incentive-payment-program-model-reforming-medicaid/> design content for its Performing Provider Systems Learning Symposium<http://www.chcs.org/project/new-york-state-dsrip-performing-provider-systems-learning-network/> and has also helped Rhode Island and California from early stages of their delivery system reforms. From our vantage point, we are seeing accelerated momentum around DSRIP and "DSRIP-like" efforts in states across the nation. [Interactive Map: State DSRIP and DSRIP-like Programs]<http://www.chcs.org/resource/delivery-system-reform-incentive-payment-mapping-state-programs/>In the two years following the passage of the ACA, the federal government approved the first DSRIP initiatives in California, Texas, Massachusetts, New Jersey, and Kansas. Next, New York's DSRIP program was approved in 2014, followed by New Mexico in 2015, then New Hampshire and Washington in 2016 (the latter is still pending final Special Terms and Conditions). Virginia is in the process of negotiating their DSRIP program with federal partners - and Massachusetts is also pending approval for a more ambitious renewal of their first DSRIP waiver. Though DSRIP efforts originally sought to make up for reduced Medicaid Disproportionate Share Hospital (DSH) payments to safety-net hospitals under the ACA, they have evolved to promote wider-scale payment and delivery system reforms, e.g., initiatives aimed at lowering preventable hospital readmissions. Federal requirements for DSRIP have also evolved to emphasize shared financial accountability for measurable improvements in health outcomes. There has also been an increasingly broader inclusion of provider partners over the span of DSRIP state approvals. For example, the first DSRIP state, California, rewarded hospitals based on patients receiving the specific agreed-upon intervention; Texas rewarded hospitals for all patients that met the measurement criteria within the provider system; next came New Jersey and a few other states that began making payments based on all attributed patients; and the most recent progression has been in New York, where payment is based on all attributed Medicaid members within the provider system's geographic region. Notably, recent DSRIP negotiations require: (1) a more defined set of project options; (2) participation of social service providers and community-based organizations; and (3) clearly defined outcome metrics and statewide benchmarks upon which an increasing proportion of funds are dependent. DSRIP projects range from condition-specific approaches (such as in New Jersey, New Mexico, and Kansas) to building up the infrastructure for alternative payment models through provider networks, such as is occurring in Texas, Massachusetts and New York. 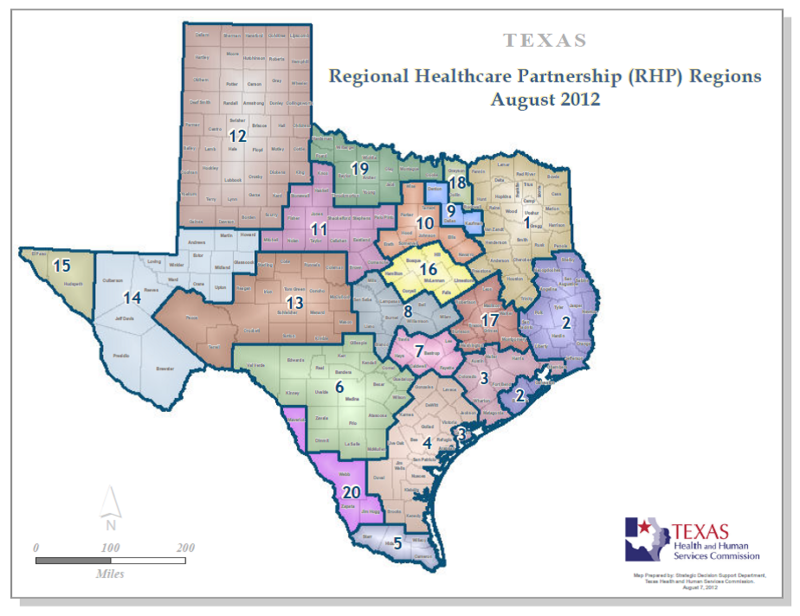 * Texas<https://hhs.texas.gov/laws-regulations/policies-and-rules/waivers/medicaid-1115-waiver/tools-and-guidelines-regional-healthcare-partnership-participants> was the first to require participating providers to join networks, called Regional Healthcare Partnerships (RHPs)<http://thotonline.org/wp-content/uploads/2015/11/anchors.png>. Its waiver allows for managed care expansion to additional areas of the state, and splits incentive payments across the 20 RHPs. Payments to these regional provider groups are based on various outcome measures, such as the average inpatient length of stay. * In New Jersey<https://dsrip.nj.gov/>, the 49 DSRIP-participating hospitals focus on improving care management for common chronic conditions: asthma; behavioral health and substance use disorder (SUD); cardiac care; diabetes; HIV/AIDS; obesity; or pneumonia. For example, the nine hospitals that opted to concentrate on SUD are: (1) using electronic self-assessment decision-support tools; (2) creating integrated health homes for those with severe mental health needs; and (3) enforcing hospital-wide screening for SUD. * New York's DSRIP<http://www.health.ny.gov/health_care/medicaid/redesign/dsrip/> is designed to fundamentally change how care is paid for and provided in the state. By 2020, 90 percent of managed care organization payments to providers must be value-based and avoidable emergency department visits must be reduced by 25 percent. Oregon, Florida, Arizona, and Rhode Island have implemented or are in the process of negotiating "DSRIP-like" programs. Similar to DSRIP initiatives, these programs also use Medicaid Section 1115<https://www.medicaid.gov/medicaid-chip-program-information/by-topics/waivers/1115/section-1115-demonstrations.html> waiver authority to incentivize system transformation and quality improvement for health care settings serving low-income patients. However, these states did not specifically apply as a DSRIP program, and as a result they: (1) avoid the additional requirements imposed on DSRIP programs; and (2) may include some federal grants or matching funds, but forfeit funding available through DSRIP. Instead, states undertaking DSRIP-like reform efforts use the more general Section 1115 authority and funding, alongside other funding avenues<http://www.nga.org/files/live/sites/NGA/files/pdf/2015/1504HealthLearningBreakoutCHeffron.pdf> (e.g., Designated State Health Programs, Intergovernmental Transfers, and State General Fund appropriations). For example, Oregon's DSRIP-like program - the Hospital Transformation Performance Program (HTPP)<http://www.oregon.gov/oha/analytics/Pages/Hospital-Baseline-Data.aspx> - was funded in part by one percent of the state's annual hospital assessment, which totaled around $150 million for this year's incentive payments, as well as additional federal funds under the 1115 waiver. Similar to some state DSRIP programs, Oregon's urban hospitals may earn incentive payments based on specific performance objectives linked to substantial monitoring and assessment activities. Want More Information on DSRIP and DSRIP-Like Programs? See CHCS' interactive map<http://www.chcs.org/resource/delivery-system-reform-incentive-payment-mapping-state-programs/> for a comparison of the states implementing or applying for DSRIP and DSRIP-like programs.